This is the 256th edition of the Epileptic Gibbon podcast music show and the playlist to accompany it. You should be able to CLICK HERE TO DOWNLOAD but note the shows are large files. Unfortunately the iTunes subscription no longer appears to be working so either download the show via the link above, or stream the show via Mixcloud (if you become a follower you can find out whenever I add new shows there) and the show can also be found on the Progzilla Radio Network (the show appears on Progzilla in alternate weeks). This a very special show for me personally as we’ll be celebrating the life and musical loves of my late friend and regular Eppy Gibbon listener, Ed Elloway. Ed very tragically passed away back in February of this year and this show will, if only in a very small way, pay tribute to him, by featuring music that we both loved, music that he introduced to me, and music that I introduced to him (both via the Eppy show & outside of it). There will also be tributes to Ed from other listeners along with tracks they’ve selected, & of course stories about Ed, shared experiences, & reflections on a great life, albeit one that ended far too soon. Ed loved so many different bands and artists that I decided not to pick a feature album or artist this time but instead to choose as wide ranging a mixture of music as possible, so that’s what you’re gonna get. Below you’ll find the track list, plus weblinks from where you can find more information about each artist. Total running time: 2 hours & 35 minutes. Downloaded file is 141.8 MB. Thanks to all the musicians who contributed and to all listeners. Send us comments if you like what you hear (or even if you don’t… feedback is so important!). If you want to keep up to date with news about the show, EppyFest, or just chat with other listeners, don’t forget that there’s a Facebook group – just search for the Eppy Gibbon Podcast Show on Facebook and request to join, plus don’t forget that we’re now part of the Progzilla Radio Network. For the next show I’ll be back again with another tribute to someone we’ve lost this year, as our feature artist will be none other than Peter Tork. In addition, you can expect the usual eclectic musical mixture, so I hope you’ll join me then. This is the 255th edition of the Epileptic Gibbon podcast music show and the playlist to accompany it. You should be able to CLICK HERE TO DOWNLOAD but note the shows are large files. Unfortunately the iTunes subscription no longer appears to be working so either download the show via the link above, or stream the show via Mixcloud (if you become a follower you can find out whenever I add new shows there) and the show can also be found on the Progzilla Radio Network (the show appears on Progzilla in alternate weeks). 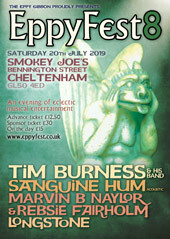 The main focus for this show is to preview my own upcoming live music event EppyFest 8, happening in Cheltenham on the evening of Saturday 20th July at Smokey Joe’s. You’ll hear tracks from all four of the acts playing at EppyFest this year, including a feature album, ‘Interconnected’, the latest album by Tim Burness who will, along with his band, be headlining EppyFest 8. We’ll also cover the usual diverse selection of styles and genres, as we feature music from bands/acts who have played at previous EppyFests, play some tracks connected to this year’s Winter’s End Festival & Cheltenham Jazz Festival, & there’s also some music I’ll be playing, well, just because I really like it, basically. Below you’ll find the track list, plus weblinks from where you can find more information about each artist. Total running time: 2 hours & 2 minutes. Downloaded file is 111.7 MB. Thanks to all the musicians who contributed and to all listeners. Send us comments if you like what you hear (or even if you don’t… feedback is so important!). If you want to keep up to date with news about the show, EppyFest, or just chat with other listeners, don’t forget that there’s a Facebook group – just search for the Eppy Gibbon Podcast Show on Facebook and request to join, plus don’t forget that we’re now part of the Progzilla Radio Network. For the next show I’ll be back again with a very special show for me personally as we’ll be celebrating the life and musical loves of my late friend and regular Eppy Gibbon listener, Ed Elloway, so I hope you’ll join me for that. This is the 254th edition of the Epileptic Gibbon podcast music show and the playlist to accompany it. You should be able to CLICK HERE TO DOWNLOAD but note the shows are large files. Unfortunately the iTunes subscription no longer appears to be working so either download the show via the link above, or stream the show via Mixcloud (if you become a follower you can find out whenever I add new shows there) and the show can also be found on the Progzilla Radio Network (the show appears on Progzilla in alternate weeks). I hope you enjoyed the previous show in which I counted down my 10 favourite albums of 2018. But this time we’re much more focused on 2019 music, so you’ll hear lots of great music released so far this year, plus we’ll also have a featured artist, the mighty Esperanza Spalding, so we’ll have three tracks either from or featuring her, plus we pay tribute to the sadly recently departed Mark Hollis & Hal Blaine. Below you’ll find the track list, plus weblinks from where you can find more information about each artist. Total running time: 2 hours & 33 minutes. Downloaded file is 140.2 MB. Thanks to all the musicians who contributed and to all listeners. Send us comments if you like what you hear (or even if you don’t… feedback is so important!). If you want to keep up to date with news about the show, EppyFest, or just chat with other listeners, don’t forget that there’s a Facebook group – just search for the Eppy Gibbon Podcast Show on Facebook and request to join, plus don’t forget that we’re now part of the Progzilla Radio Network. For the next show I’ll be back again with an EppyFest 8 preview, when you’ll hear tracks from all four of the acts who will be playing in Cheltenham on Saturday 20th of July at Smokey Joe’s, plus lots of other great music, so I hope you’ll join me for that. This is the 252nd edition of the Epileptic Gibbon podcast music show and the playlist to accompany it. You should be able to CLICK HERE TO DOWNLOAD but note the shows are large files. Unfortunately the iTunes subscription no longer appears to be working so either download the show via the link above, or stream the show via Mixcloud (if you become a follower you can find out whenever I add new shows there) and the show can also be found on the Progzilla Radio Network (the show appears on Progzilla in alternate weeks). I hope you enjoyed the previous show in which I started my countdown of my 30 favourite albums of 2018. Back then we covered the albums I placed between 30 and 21 in the countdown, but here we move onto the albums placed between 20 and 11. You can expect a great mixture of music in this show, and a typically eclectic playlist, with two tracks each from the 10 brilliant albums in this part of the countdown. And we also have a feature artist, in the form of Sheffield-based composer, musician and polymath Jarrod Gosling, as we’ll be having three tracks featuring him on this show. Below you’ll find the track list, plus weblinks from where you can find more information about each artist. Total running time: 2 hours & 17 minutes. Downloaded file is 125.4 MB. Thanks to all the musicians who contributed and to all listeners. Send us comments if you like what you hear (or even if you don’t… feedback is so important!). If you want to keep up to date with news about the show, EppyFest, or just chat with other listeners, don’t forget that there’s a Facebook group – just search for the Eppy Gibbon Podcast Show on Facebook and request to join, plus don’t forget that we’re now part of the Progzilla Radio Network. For the next show I’ll be back again concluding my countdown of my favourite albums of 2018, as we reach the albums I’ve placed from 10 to 1, my very favourites of last year, so I hope you’ll join me for that – it should be a most excellent show.